Top Soigné with black screws, rhodium plated, automatic mechanical chronograph personalized to U-Boat specifications for date display and stem to be positioned at 9 o’clock. Frequency: 28.800 vibrations per hour, 4 Hz. Power reserve: 48 hours. 25 jewels. Height: 7 mm. 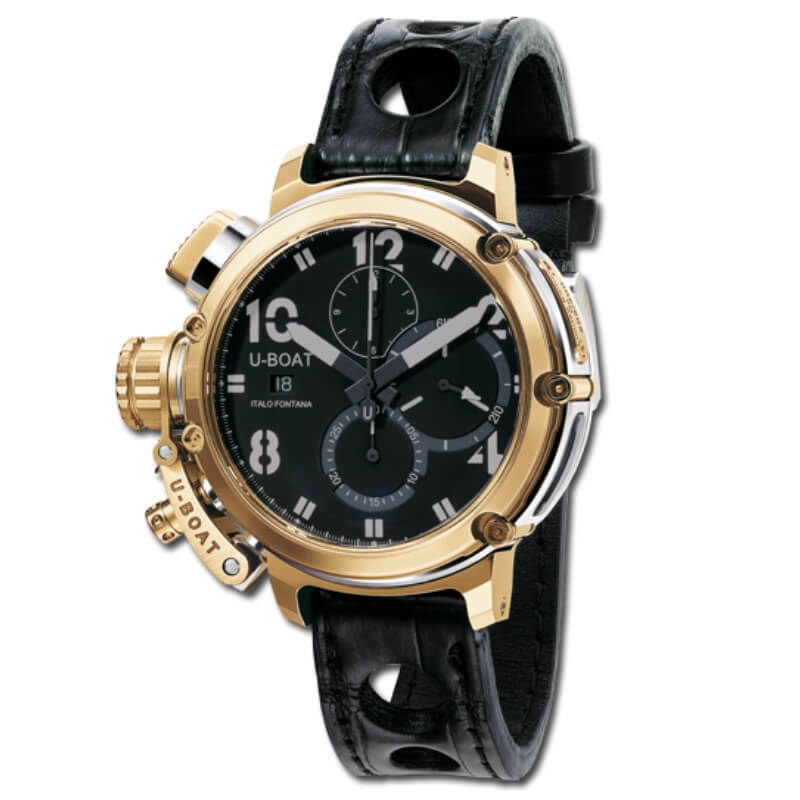 Hours, minutes, small second, chronograph 60 s, counter 30 minutes and 12 h. Date window at 9 o’clock. AISI 316 Plus stainless steel and rose gold 2N 18 K, 46 mm diameter, five pieces construction. The bezel and the back of the case are locked together by external tubing and a customized key that ensures absolute water-proofing. Personalized rotor, in silver, rhodium treated, two tone finishing, build with a base and 3 bridges fixed with blue screws. Components in rose gold: bezel, external case tubing and screws, horns of the case, hook, cup crown, chrono pushers, serial number plate. Total gold 54,4 gr. Case with a side window, with a fumé sapphire glass which allows the movements view. Two superimposed dials, hands and indexes treated with superluminova. Sapphire curved glass on the face and flat on the back of the timepiece, both fumé. Hand made and hand finished alligator, black, 3 circular cuts out, hypoallergenic and color retain treatment. Width: 20/20 mm. Tongue steel buckle.